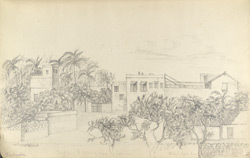 Pencil drawing of a house at Porbandar in Kathiawar by George Boyd (1800-1850) dated between 1821 and 1844. This is one of 95 drawings (90 folios), chiefly of landscapes and monuments in the Deccan, West India and Afghanistan made during that period. Boyd served in the Bombay Infantry from 1820 to 1850 and was chiefly employed in survey work. From 1822 to 1831 he was in the Deccan and Satara; in 1835 he was on survey in Kathiawar; and in 1839 he was making road surveys in Sind. He was mentioned in dispatches during the war in Afghanistan in 1840 and in 1842 he worked on a survey between Quetta and Kalat. Situated in a corner of the Kathiawad peninsula in Gujarat state, west-central India, Porbander was formerly named Sudamapuri after Krishna’s devoted friend, and has a temple dedicated to her. The town has enjoined a continuous maritime trading relationship with Africa and Arabia for centuries and still retains the tradition of building 'dhow' (an Arabian vessel generally with a single mast) on the seashore. Porbander was formerly the capital of the Jethwa Rajput princely state, however in 1807 it accepted the rule of the East India Company and continued to flourish as a prosperous port. It is also famed for its local building stone which was used in the 19th-century municipal buildings of Bombay and Karachi and is renowned as the birthplace of Mahatma Ghandi (1869).